When I decided to launch TallThought Productions, amidst the excitement, one of the biggest decisions to make was what camera should one base the production company on. Besides the normal things to consider, I also had to purchase a camera that made the most sense for my business model, and would bring my clients the biggest bang for the buck. The Panasonic HVX200 is the camera I chose, and I’m not sorry…at all. This camera offers standard frame sizes and frame rates for making high quality DVD and television spots in a variety of quality choices. It will also provide wide-screen looks at standard def and shoot at 24p giving the film look. Fantastic right? Now the fun begins. Once you step up to hi-def land at 720P, you can take advantage of the HVX’s ability to achieve film-like motion effects by over and under-cranking the frame rate, for stunning slow motion and semi time lapse in-camera effects only more expensive video and film cameras can produce. 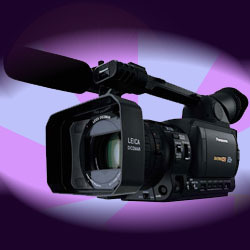 The camera also shoots many other hi-def formats including 1080i and 1080p. The HVX200 can record onto standard MiniDV for NTSC recording. The camera also records to P2 flash cards. Which means that if you’re recording to P2, there are no moving parts on the camera, unless you make lens adjustments. This leads to extremely reliable recordings and longer battery life. Footage is transferred to storage devices via 1394 firewire cable or through a USB 2.0 connection. The advantages of this camera for an independent filmmaker are numerous. The abilities of multiple frame rates, recording formats, and creative image control are all benefits to pass along to clients who expect more from their video productions. It’s no wonder many of today's media professionals rely on the HVX200 including Microsoft, who have approved this camera for their many production needs.